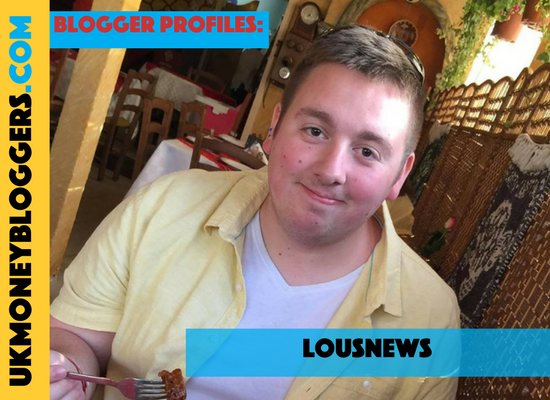 Louis Bowden blogs about money and much more on his lifestyle blog, Lousnews. Besides personal finance staples such as saving and making money, he covers diverse topics such as mental health, university life and product reviews. Louis let us find out more about his blog and his motivation. My blog is a mashup of myself. Bringing people the content they want to read, helping them improve their life one step at a time! I love saving money, I’m surprised about all the different ways that someone can actually save and I want to share all that with everyone else so they can save as much as I do! I like to talk, it’s a well known fact. People don’t always take me seriously; when I got into blogging I was too young to know what I was talking about and online people aren’t too fussed about your age. They come to read what you are putting out there and I wanted to make a difference. No Spend November! I feel that people want to learn how to save, even more so in the bathroom, and with everyone getting even more for the bathroom everyone wants to know how to de-clutter first. This way people can save money, de-clutter and possibly have fun doing it! Tough one! Probably highlighting my top three YouTubers to watch when I need to procrastinate. Everyone needs to take a break in all walks of life, no better way than listening to some music; well possibly eating! Don’t always take the label at face value, just because it’s red doesn’t mean it’s on sale! Make blogging friends. You aren’t going to know everything and if there happens to be one thing I’ve taken on board after two years of blogging is that you need blogger friends for support and advice! I’ve gained so much from the UK money bloggers group! Knowledge, advice and more importantly friends and a community I can turn to if I ever need help with pretty much anything. Oh no, don’t want to play favourites, but here we go: KatyKicker, TheMiniMillionaire and The Complaining Cow for sure!